The Foreign Secretary is visiting Pakistan on 23-24 June. Foreign Secretary William Hague, arrived in Islamabad today on a three-day visit to Pakistan. This is Mr Hague’s first visit to Pakistan as Foreign Secretary. He met with Prime Minister Syed Yousaf Raza Gilani, Foreign Minister Shah Mahmood Qureshi, Minister of Interior Abdul Rehman Malik, and Chief of PML-N Mian Mohammad Nawaz Sharif. He will also answer questions on Pakistan and the region via Twitter. “I am delighted to be in Pakistan again and on an extended visit, my longest overseas visit so far since my appointment as Foreign Secretary. The new British Government is committed to a long-term, productive and friendly partnership with Pakistan. We want to maintain and strengthen the relationship that our countries enjoy, making the most of all the opportunities in the very broad relationship between our countries. 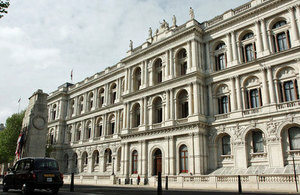 Follow the Foreign Secretary’s visit on the British High Commission’s Twitter feed @ukinpakistan or on Facebook. **If you would like to ask the Foreign Secretary a question about UK/Pakistan post your questions to @WilliamJHague using the hashtag #fsinpak. You can see his answers by either following his twitter feed or coming back to this page later.